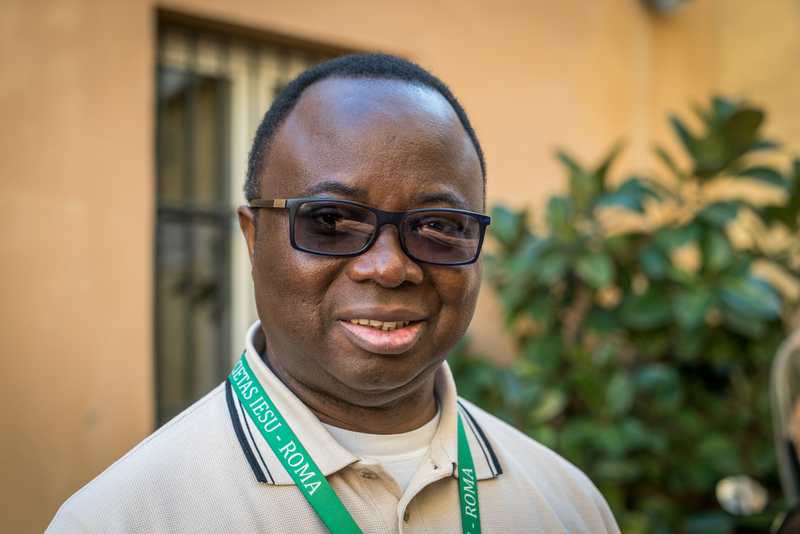 What has touched me the most (in the sense of challenging me) at this 36th General Congregation, as a Jesuit from the Central African Province (ACE)? Firstly, a few words on the Central African Province. It is made up of two countries: Angola and the Democratic Republic of Congo (DRC). The Jesuits arrived in Angola in 1622 and in the DRC in 1889. ACE is in fact the oldest of the African provinces. It was established as a province in 1965. Currently there are 410 members in the province, including those who reside outside the province. The province has several apostolic works including retreat centers (5), parishes (12), social centers (5), schools (8), and since the beginning of this academic year 2016-2017, a university, Université Loyola du Congo (ULC). If it is true that the ACE Province is already, in itself, a household of ethnicities, cultures, languages, races and diverse traditions, in the very composition of its members coming not only from Angola and the Democratic Republic of Congo, but also from Europe and Latin America. And if it is true that we already live out a sense of unity and belonging to the same apostolic body, this feeling of unity and a shared identity is what has challenged me the most during the 36th General Congregation. In effect, it gives a lot to think about. Nevertheless, beyond this diversity of cultures and civilizations, the feeling of unity and common identity has been the over-riding influence. This is not only in the discussions we have had about the fundamental directions to take for the mission of the Society in our contemporary world, but also about our lifestyle and our “way of proceeding.” This is evident in the modesty of our appearance, the simplicity of our way of dressing, the sense of rigor and asceticism, Jesuit humor. It is evident in the inclination to always give first preference to the other person and the spontaneous application of number 22 of the Spiritual Exercises – the rule that instructs us to always give a positive interpretation in our discussions with others, but also, alas, our well known reputation for not being the best of singers, especially in choir…). It is also true that we have sometimes had difficult exchanges on certain issues concerning our life and mission in the Society and in the Church. But this is only natural and comes from the inherent difficulties of the process of a “rational discussion” (Habermas). The differences in points of view in any given group are not to be construed as signs of division. Rather, they are part of the process of discernment in which one tries to search for the will of God in order to accomplish it more efficaciously. It is in this context that I would like to situate the fundamental experience that has touched me a lot (in the sense of consolation) during this General Congregation. In this way, whether one is from Vietnam, East Timor, England, Belgium, the United States, Russia, Croatia, Venezuela, Brazil, Cuba, Japan, Italy, France, India, Slovakia, Germany, China, Canada, Burkina Faso, Guinea Conakry, or the Democratic Republic of Congo; as Jesuits, we all speak the same language, that of working for the salvation of souls and promoting the greater glory of God. And so it is wonderfully consoling to discover that all Jesuits, beyond their cultural differences, are gathered under the same banner. This is largely thanks to our Jesuit formation in which resides the “secret” of the Jesuit identity: the Spiritual Exercises of St. Ignatius of Loyola. So here is a model of unity and identity that we could propose, mutatis mutandis, to our world which tends to liken, wrongly, our contemporary state of cultural pluralism to a confrontation (or a war) between civilizations and peoples. In effect, the pluralism, which is at the heart of our globalized universe, is not a curse. It is possible to construct a common identity if and only if we learn to speak, through our different languages and cultures, a common language, that of the peace of God and justice for all. The example of the Society of Jesus, amongst so many others in the Church, can, in this way, be a stimulus in this direction in today’s world.